I only make bows using Carbon Fiber sticks. I use NO WOOD in any bows, although I can make them LOOK like wood. Incredibows is a cruelty free product, animal and tree friendly!! NO Horsehair is used. ALL the “hair” is made of tough polymer filament designed to grab the strings well (when rosined) and last literally YEARS! Bow AND hair is warranted to last a minimum of three years. Some musicians have regularly used the same Incredibow for several years, without loss of even one hair! WE HAVE NO IDEA HOW LONG THIS BOW WILL LAST WITH PROPER CARE. All the bows bow “outward” and the hair is permanently tensioned. They are NOT designed for rehairing – if it wears out before three years we’ll send you a new bow. We’ll also give generous trade-in value on a new bow. BOW WEIGHT: Over 75% of our Incredibows are now sold in FEATHERWEIGHT version – almost HALF the weight of traditional bows – and not even possible to achieve as traditional wood bows. 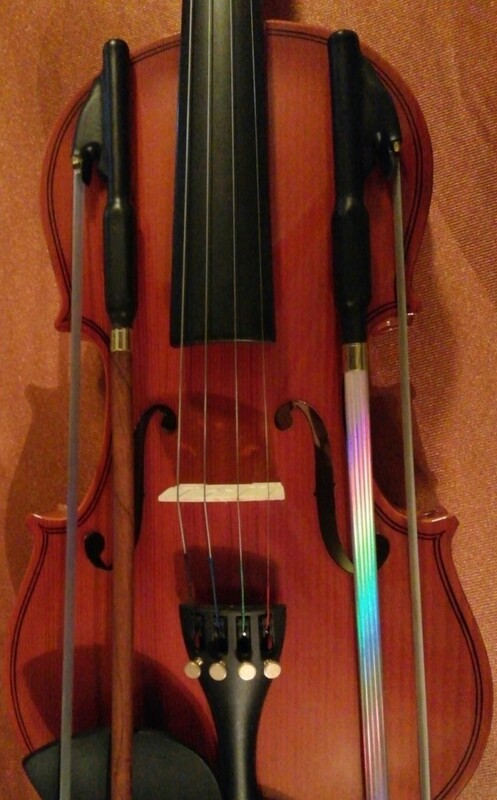 Incredibow “hair” grabs the strings of your instrument better than the traditional horsehair or other synthetic hair. You will experience a new freedom of play, reduced fatigue and faster bow response than ever expected! However, we will make your Incredibow any weight you want, upon request at no extra charge. ** If you have a specific weight, please send us an email at incredibow@yahoo.com with your specific details. 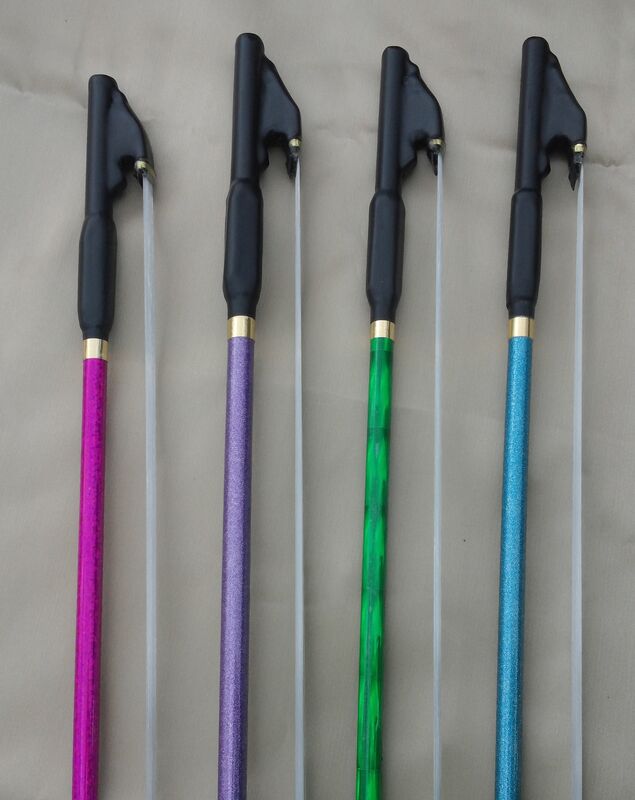 Incredibow sticks are available in THREE types of stick finishes; (1.) BASIC smooth sanded graphite (formerly called “No Frills” and least expensive), (2) polished graphite with transparent gloss coat (“Black Panther”), and (3), a unique array of COLORS available in PVC film covering. 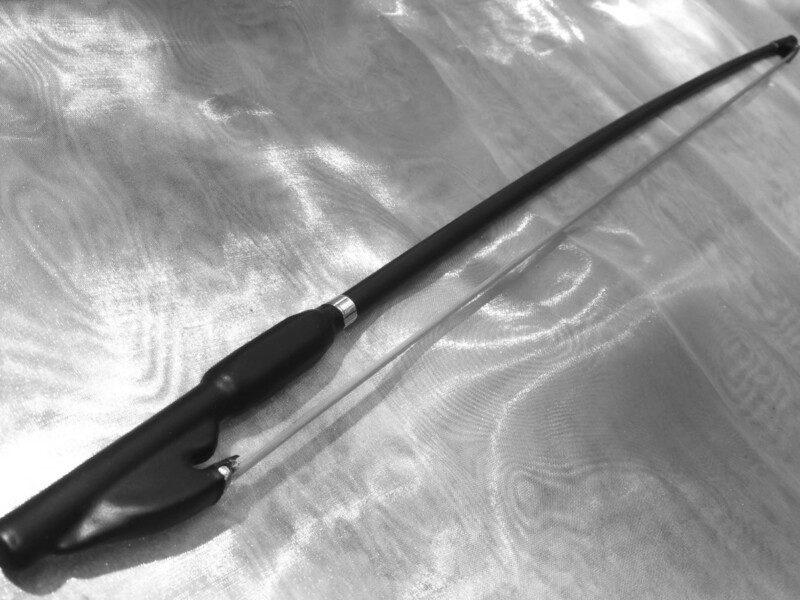 The first is least expensive and most durable: BASIC INCREDIBOW with graphite satin stick. THIS BOW WE HAVE CALLED “NO FRILLS” AND HAS BEEN ONE OF OUR MORE POPULAR BOWS. THIS BASIC INCREDIBOW AND HAS ALL THE QUALITIES OF OUR INCREDIBOWS. RUGGED and SUITABLE FOR ALL VENUES. “BLACK PANTHER” – Polished graphite, coated with gloss transparent coating. BEAUTIFUL AND DURABLE FINISH. IT IS A NEARLY BLACK COLOR WITH GRAPHITE FIBER “GRAIN”. CHOICE OF MANY PVC “FILM” COVERINGS ON THE STICK – WOOD LOOK, SPARKLEY, HOLOGRAOPHICS, STONE, METALLICS – MORE. THIS OPTION IS ESPECIALLY FOR MUSICIANS USING INSTRUMENTS WITH MORE THAN 4 STRINGS. Available as an option for any Incredibow. Something not even possible with a horsehair bow – at least DOUBLE the tension of the usual bow! This utilizes a DOUBLE THICK WALL in our sticks, allowing the high tension without adding more arc in the bow. However, these high tension bows are of medium weight, due to the thicker wall – NOT available in the featherweight version. This also has the wider stick thickness (AS WITH OUR CELLOBOWS) for any of the violin, viola or cello HIGH TENSION option. 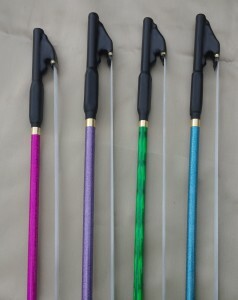 The High Tension works well for aggressive players and also has less bounce than our regular tension bows. This option is an additional $30 to usual price of Incredibow. Consider this: relatively little has changed in bowmaking in at least the past 250 years! Only the stick composition is new in some cases. Line up several brands and price range bows – from $80 to $8,000 bows – they all look alike – and they all look like the bows of hundreds of years ago! What other technology stopped changing it’s product 250 years ago? Sturdy and affordable, Incredibow has changed all that. Incredibow is our own patented invention and each Incredibow is hand made by us. Over sixty separate operations are performed in the assembly and finishing process – to create a bow which looks and functions simply, beautifully with little maintenance. NOTHING ELSE LIKE IT ON EARTH. 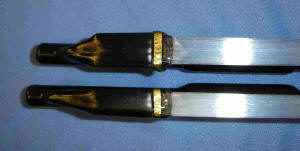 Clarity of sound: folks find Incredibow produces a sound not available with most wood bows and/or horsehair. Clean, crisp full range tones – and absence of “hair noise”! Great grab/good volume with little effort. Need for less rosin and less frequent rosining. Everlasting hair! Professional musicians who regularly had to rehair their traditional bows every few weeks or months, now have used their Incredibow for over FIVE years and still not losing even one hair! We do not know the life of our Incredihair! It is warranted for three years’ minimum. Immediate playability: With our fixed tension Incredibows you never need to loosen or tighten the hair band. It is always ready – for those brief moments to practice at home and ready to go when jamming. Play in humid weather! When other fiddlers are putting their bows and fiddles away, you can keep on playing! Health/ comfort in playing. Several Incredibow owners are now playing again when they had believed that their playing days were over. With our featherweight bow and comfortable frog/ grip, musicians now find that they are back, able to play for hours at a time when they had fatigue and pain with traditional bows. PRICE and guarantee. Several of our customers report that they have found Incredibow preferable to their $6,000 wood bow ! Many other musicians report Incredibows compare in quality/tone to bows costing hundreds of dollars more. And NO ONE will treat you better as far as doing what we can to have a satisfied customer. You can buy an Incredibow right here from the folks who invented it and handcraft the bows, or go to our “Associates” page and purchase an Incredibow from one of our resellers. How does a violin sound when played with an Incredibow? Listen to a MP3 audio file created by Simon Bacon of Northern Ireland. He composed this Aire, named Lament for Pernambuco, and he has given us permission to link to his file, which is on his webpage. Perhaps it will give you a sense of how Incredibow brings out the full range sound of the instrument. Thank you for your kind words. I’m pleased you like the Lament, and I’m very happy for you to link to my recording from your website if you wish. I’m an amateur fiddler from Northern Ireland. I played classical music from ages 8 to 18, lost interest for a few years, then discovered fiddle music about 8 years ago and never looked back. I mostly play Irish traditional music, but I’m interested in any kind of music that folks are making on the fiddle. 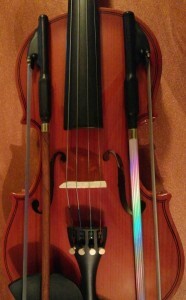 I first heard about the Incredibow on www.fiddleforum.com a couple of years ago. I must admit I was very dubious at first, but I lost my prejudices when I got to try the bows out at one of the “Fiddle Hell” events (organized partly through Fiddle Forum). Last month I bought a no-frills featherweight from Dance of Delight in England, so that’s why you don’t have a record of me. I’ve been having fun with the Incredibow, and despite some reservations, I think there’s a lot to like about it. When I’ve spent some more time with it, and gathered my thoughts, I’ll write a review and post it on Fiddle Forum.